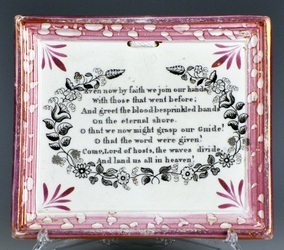 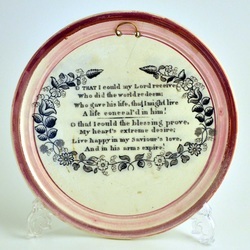 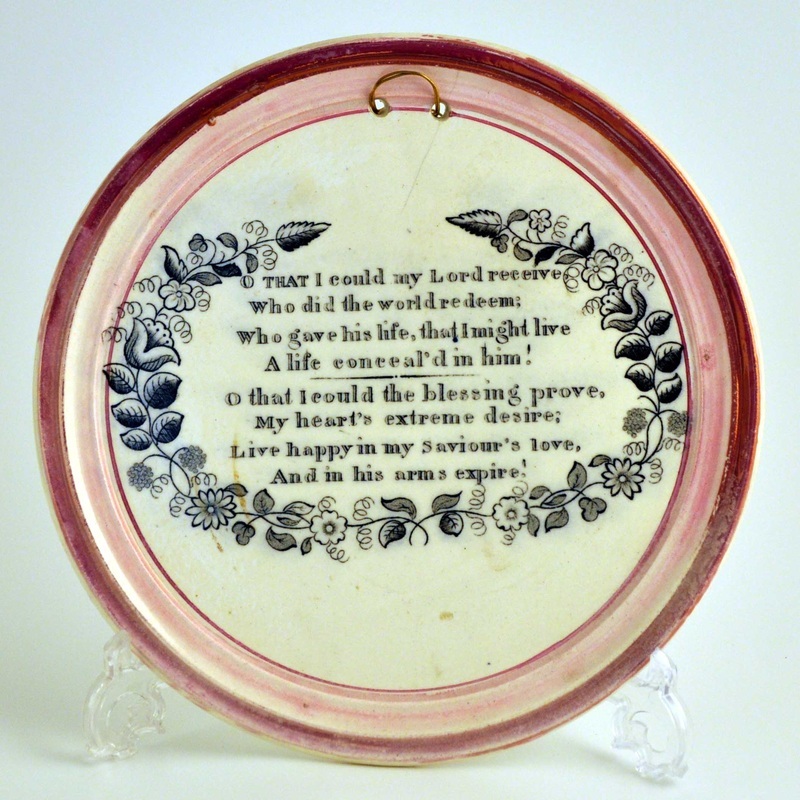 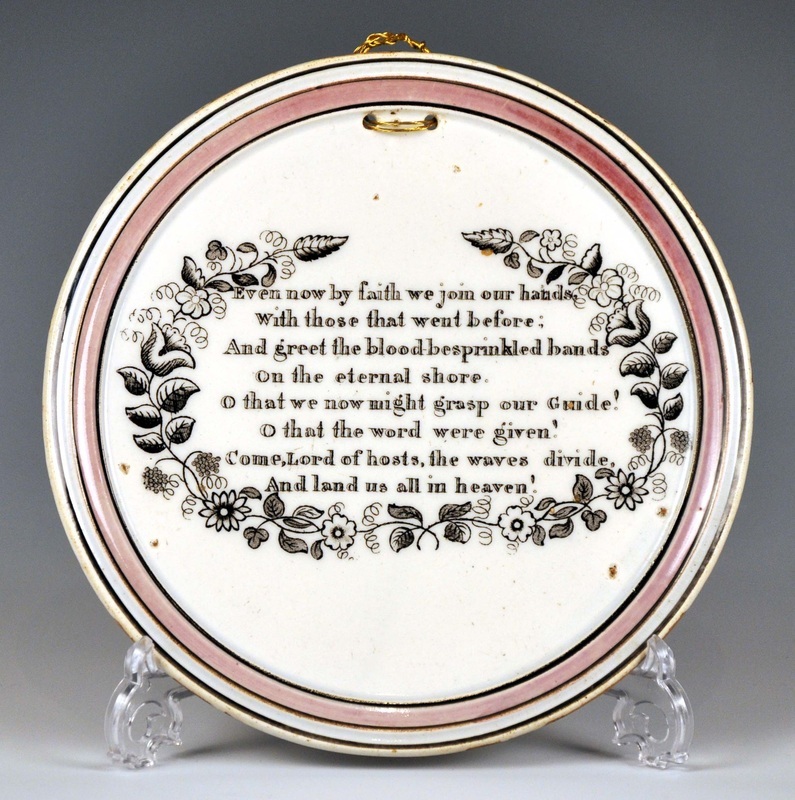 Most of the plaque forms on this page are attributed to Scott of Southwick because they share the same Wesley and Clarke transfers, and Charles Wesley verses, that appear on typical Scott items, e.g. the mug below. 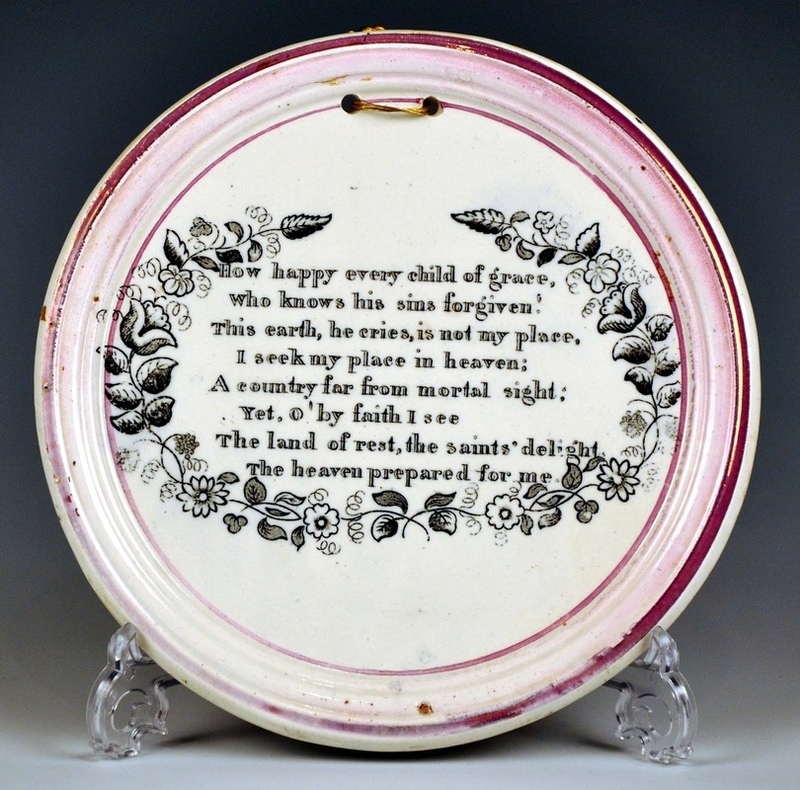 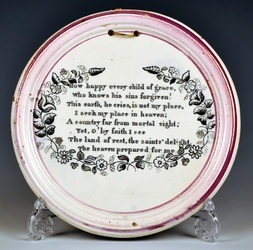 As most of the plaques on this page are of small rectangular and circular forms from the 1830s and 40s, they predate Ball's Pottery (1857-1918). For the reason stated above, the copper plates almost certainly originated from Scott of Southwick. 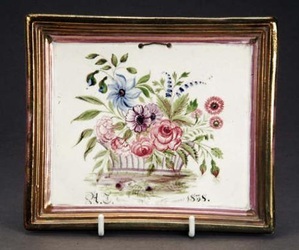 Scott's pottery closed in 1897, with an auction of effects on 26th November, some of the copper transfer plates being bought by Ball Brothers and later used at their Deptford Pottery (Baker). 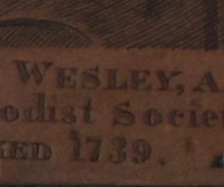 The first thing of interest is that there are two versions of the Wesley transfer. 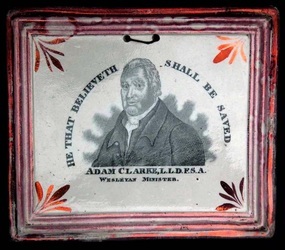 It is possible, but by no means certain, that plate 1 above was made slightly before Adam Clarke's death in 1832. 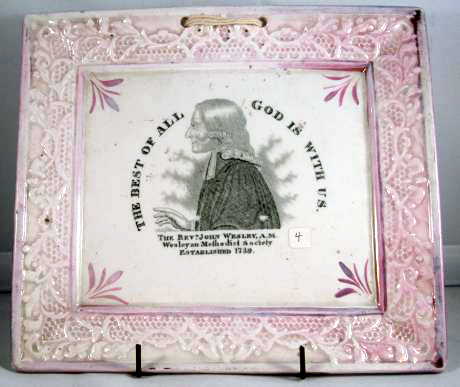 Plate 2 was probably made in that year or shortly afterwards. 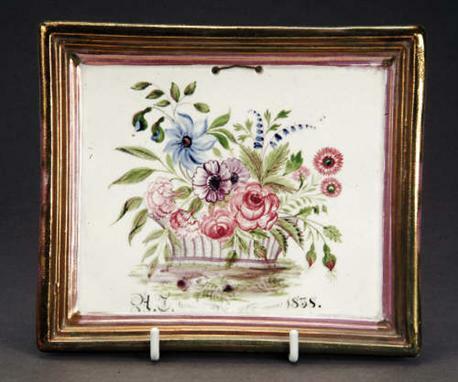 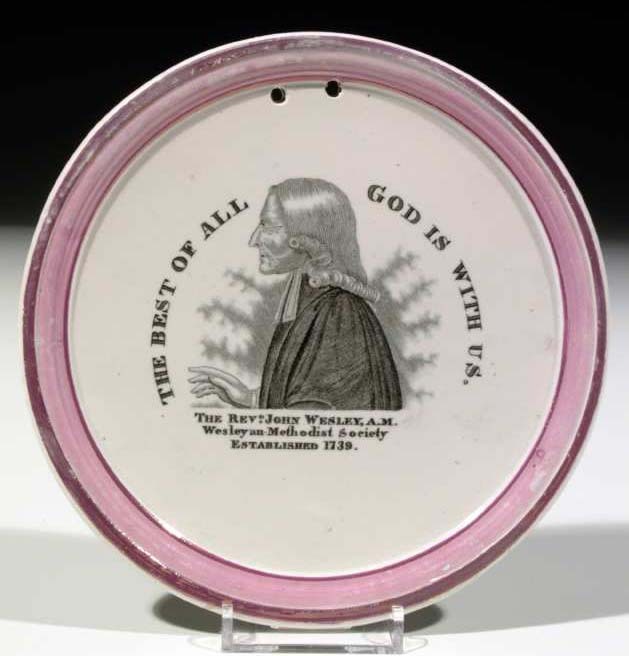 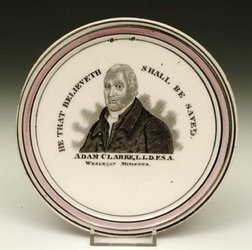 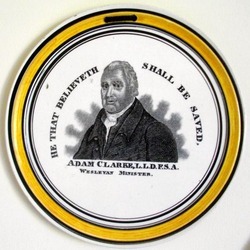 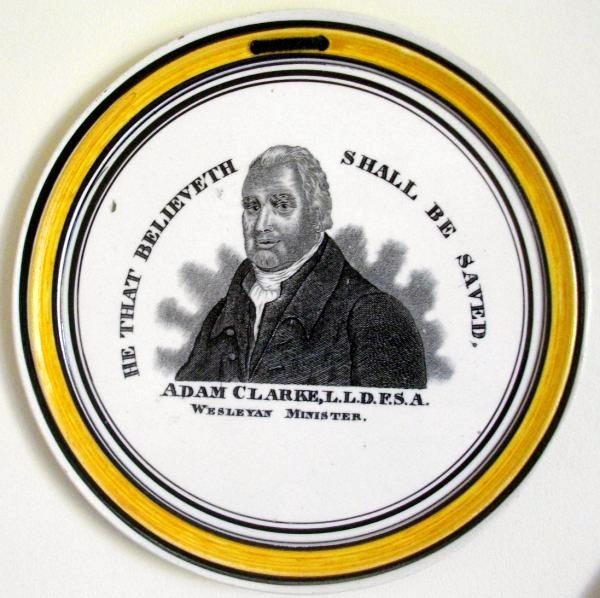 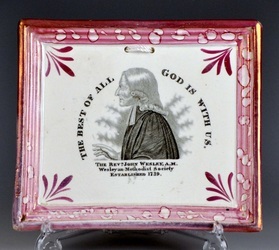 Perhaps the plates were made at the same time, and Scott envisaged a larger market for Wesley than Clarke. 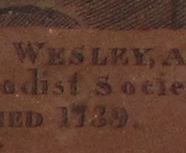 The two Wesley transfers are so similar, I'd always assumed them to be one and the same. 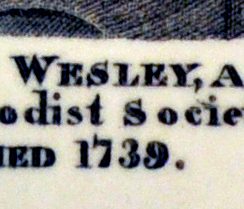 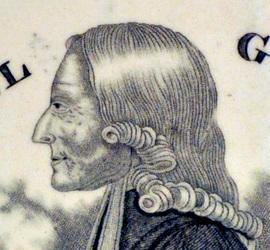 Note the position of the arms of the 'E' in the word 'WESLEY'. On plate 2 (bottom row) the centre arm is hunched up at the top of the letter. 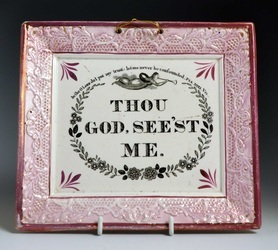 And note the letter 'i' in 'Society'. 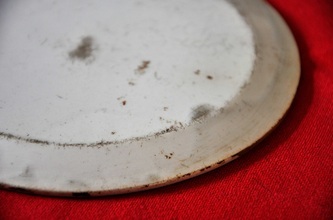 There is a tiny scratch at the top of the letter on plate 2 (bottom row) that appears on both the transfer plate (left detail) and the plaque (centre detail). 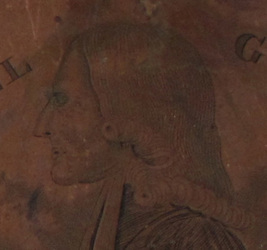 The faces of Wesley are again almost identical. 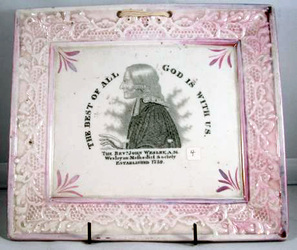 However, plate 1 (top row below) has more wrinkles to the right of the eye. 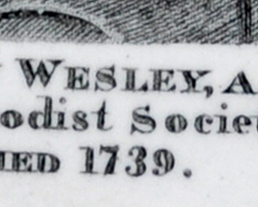 On plate 2 (bottom row) Wesley's pupil is larger. Admittedly, this is very hard to see on the worn copper plate. 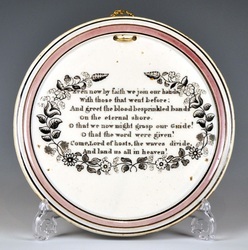 The transfer plates give a great insight into the way the plaques were produced. The circular plaques, circa 167 mm diameter. 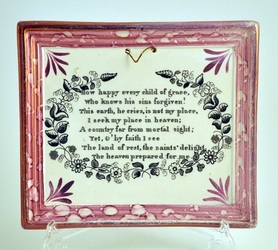 The rectangular plaques, 170 mm x 145 mm. All the plaques above have a chamfered back. 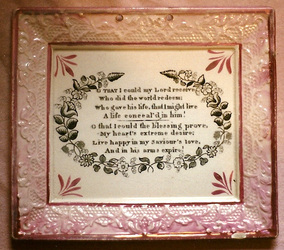 I've added the photos below. The plaque mould was in two pieces, allowing a finer shape, and minimising the amount of clay used. 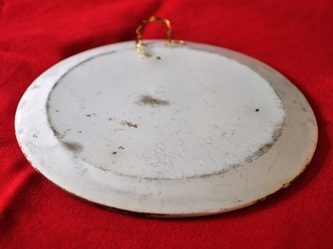 So compared to those with flat backs, these plaques are lighter. 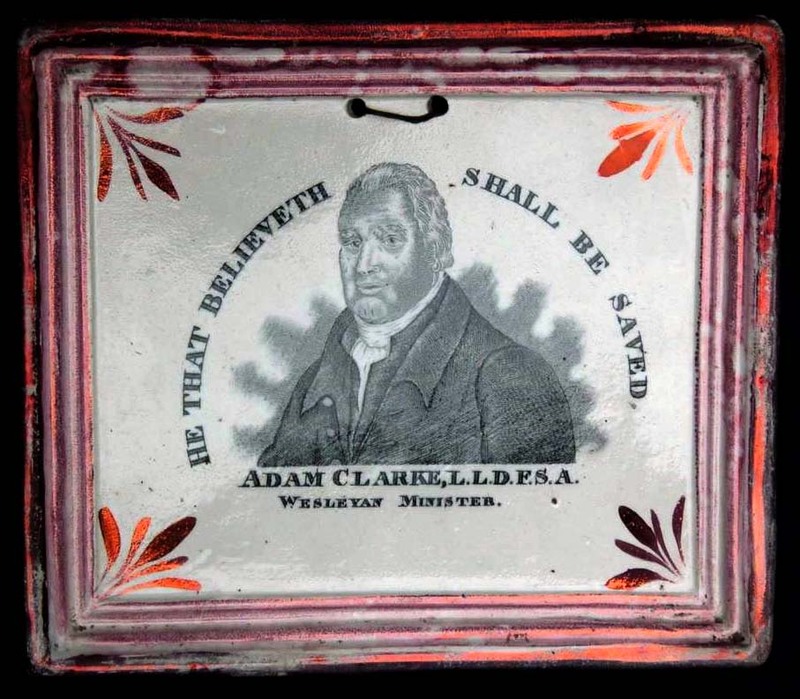 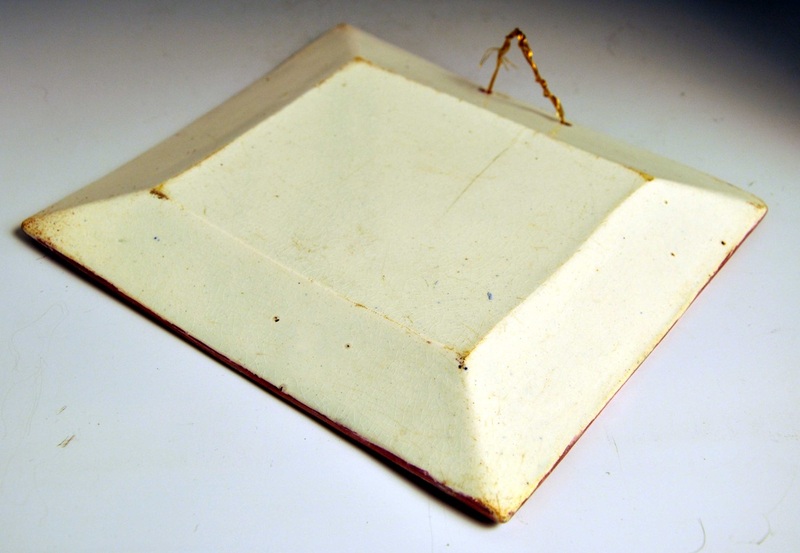 I've heard of one of these small rectangular plaques with a rounded back, so there is at least one variation to the rear mould. The circular plaques, circa 167 mm diameter. 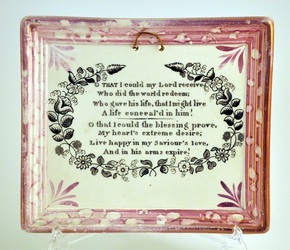 The rectangular plaques, 170 mm x 145 mm. 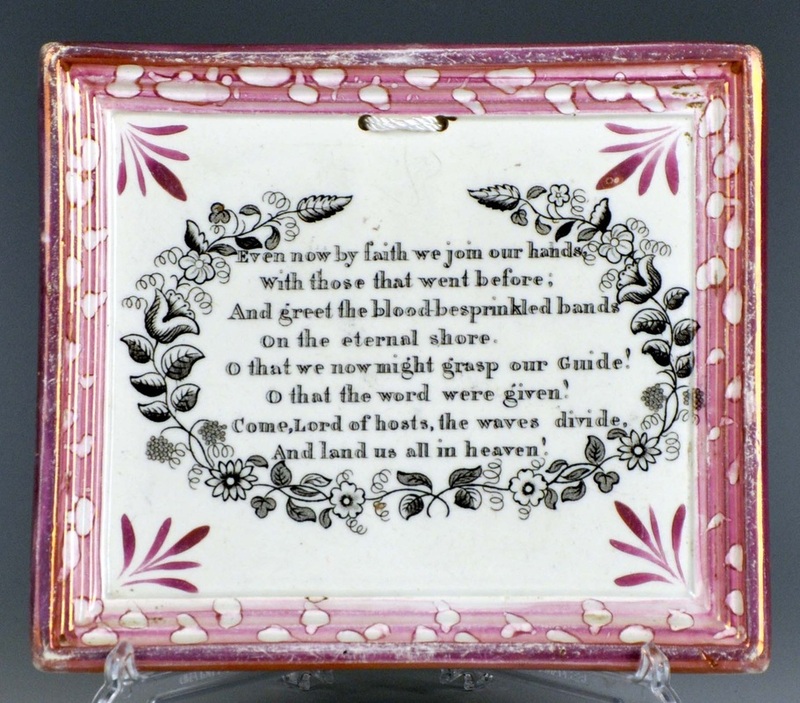 For a transcription of the verses, see the Charles Wesley hymns page. 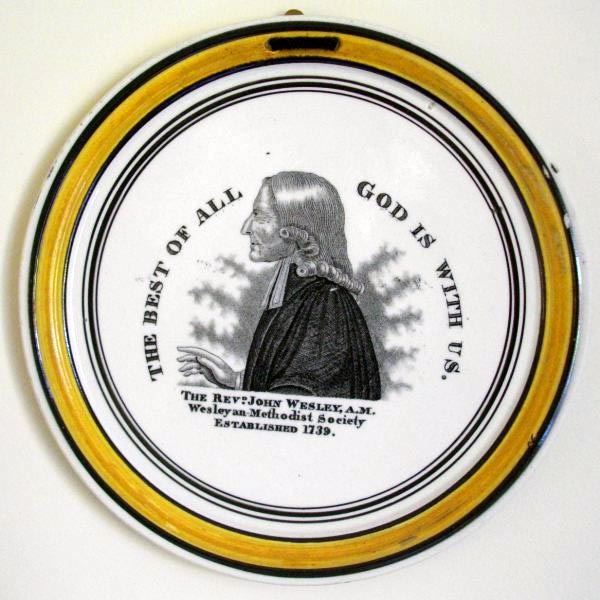 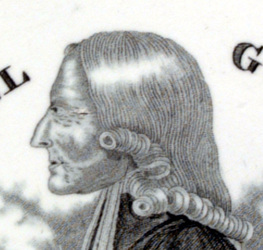 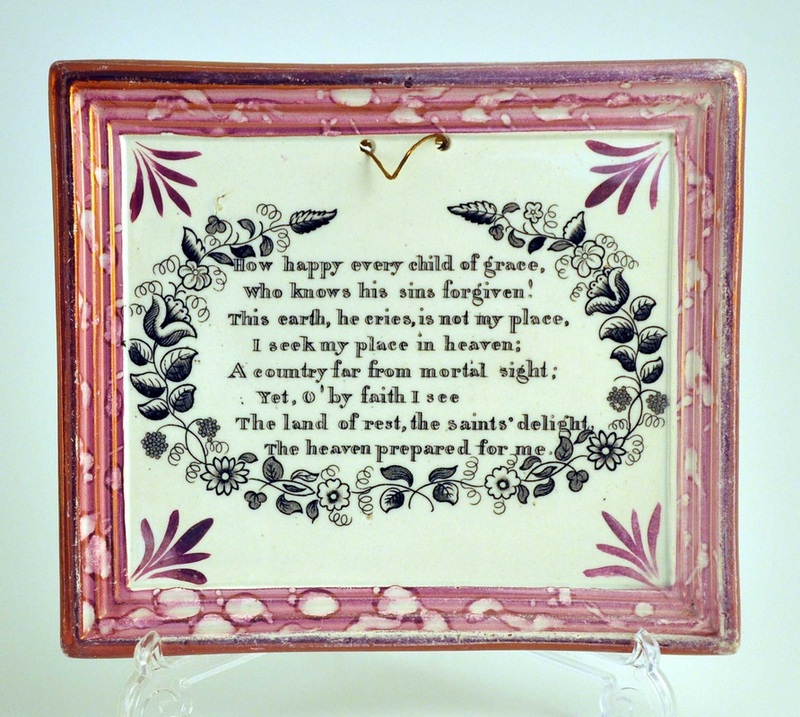 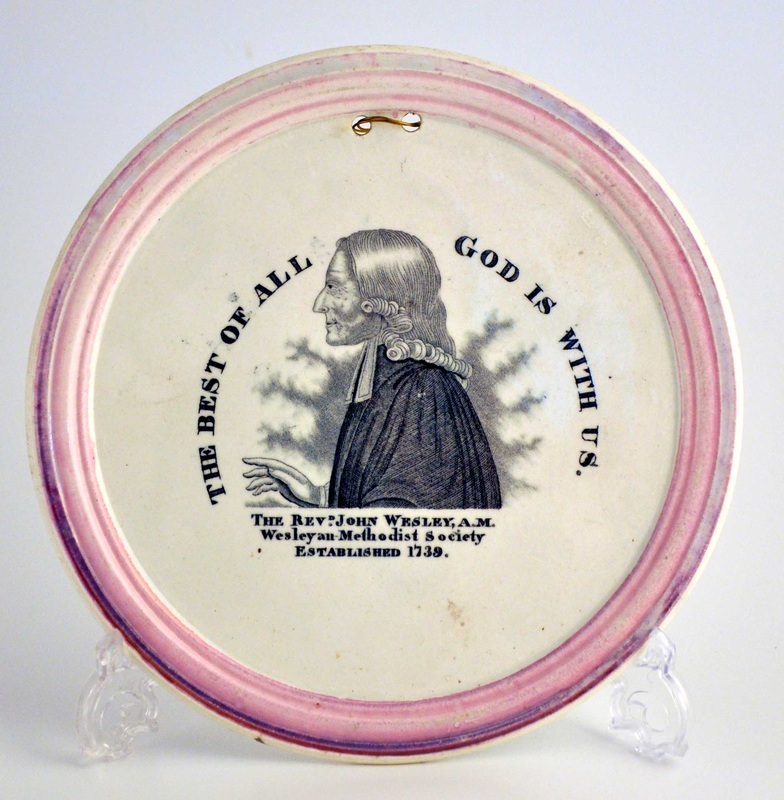 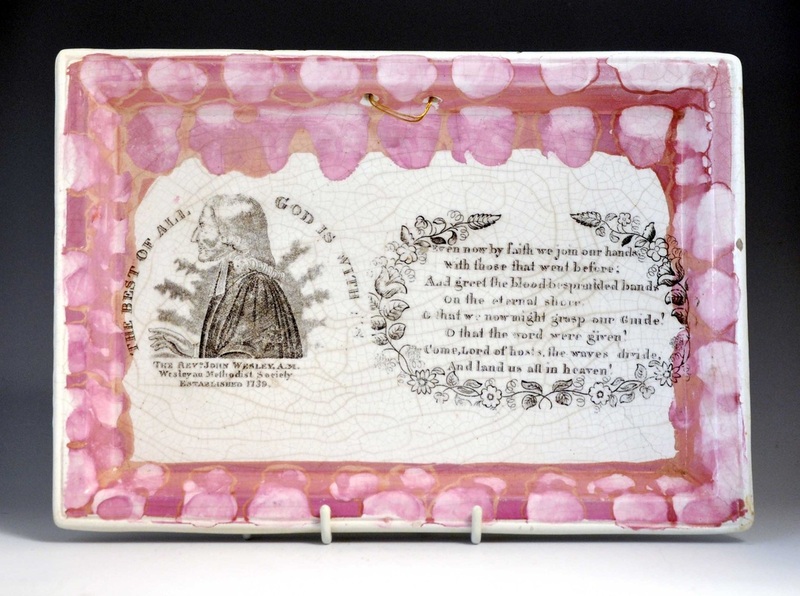 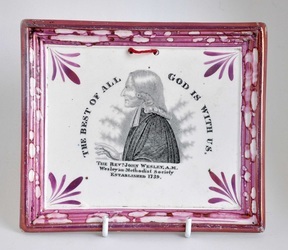 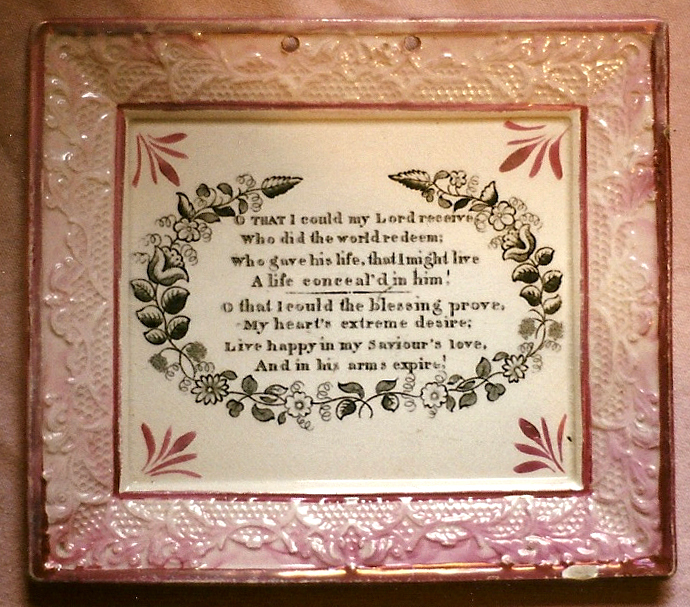 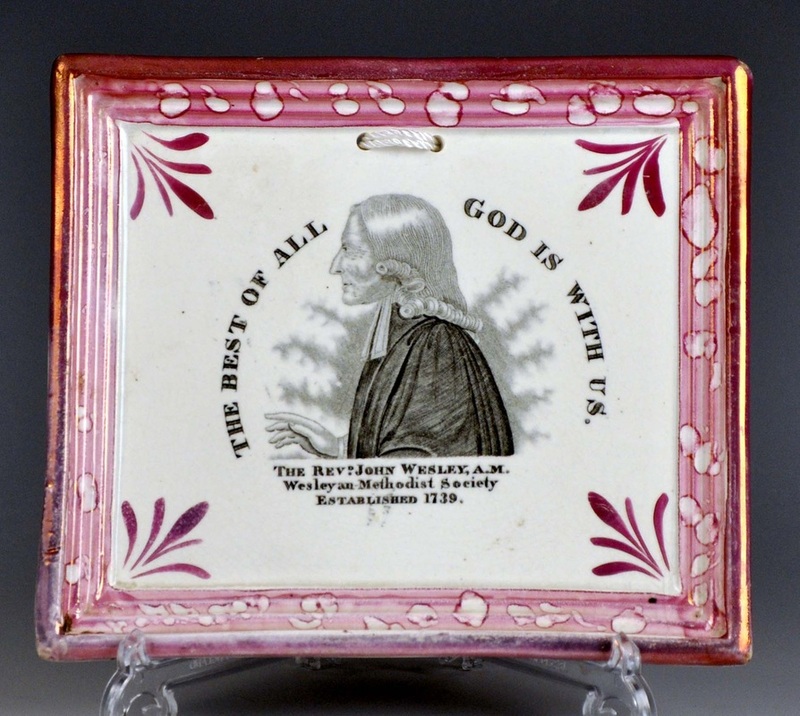 The large plaque below (265 mm x 185 mm) combines the 'Scott' Wesley with a Charles Wesley verse. 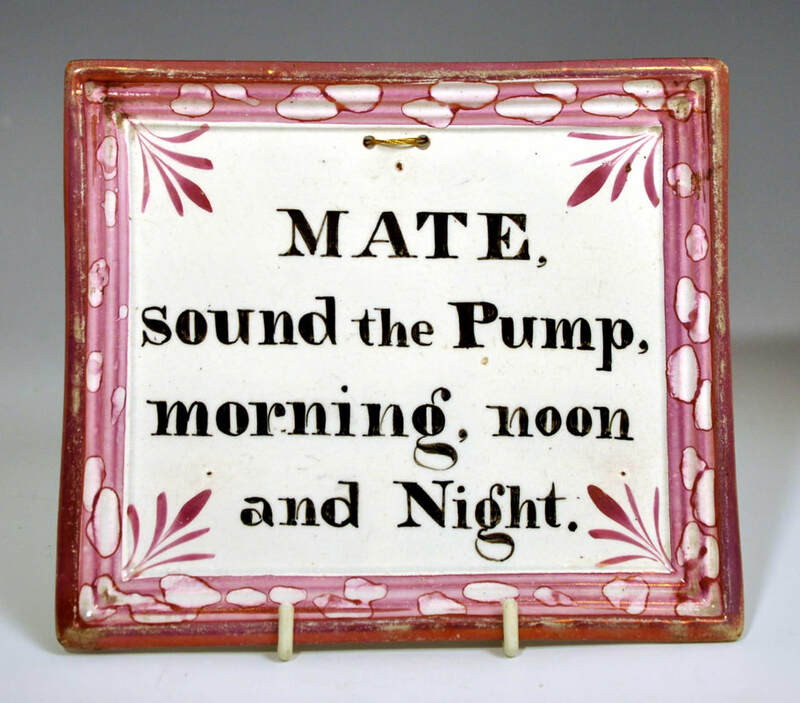 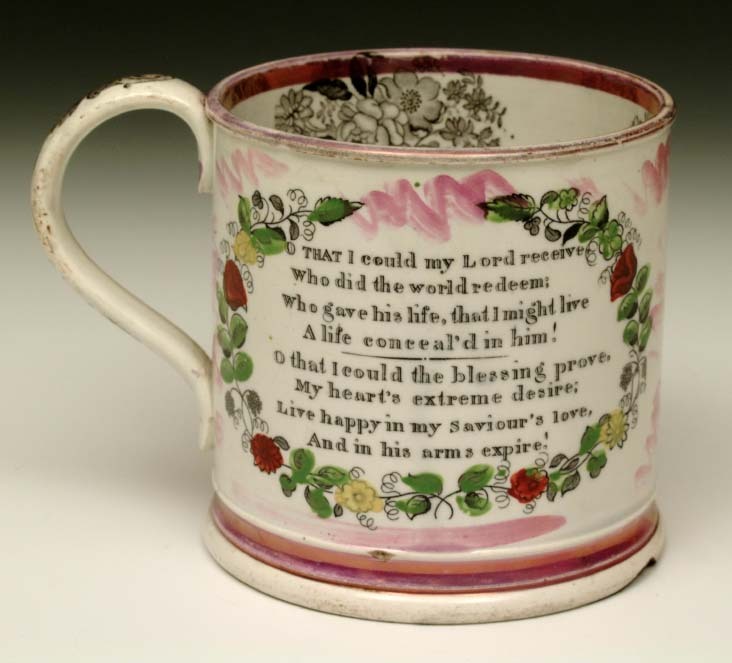 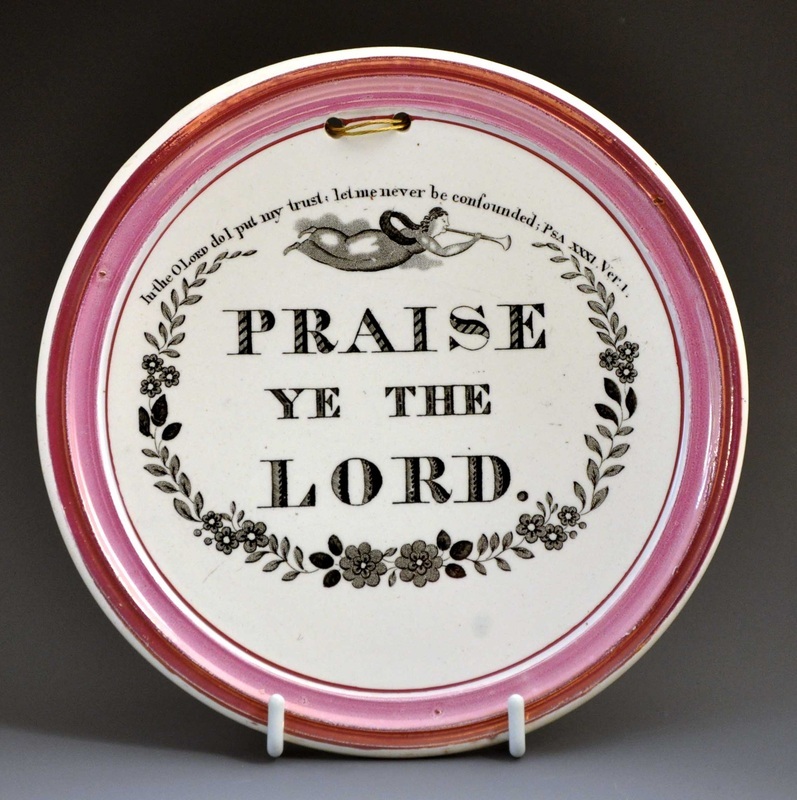 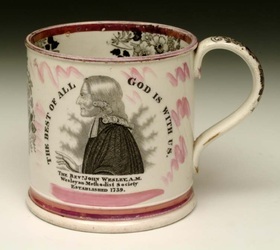 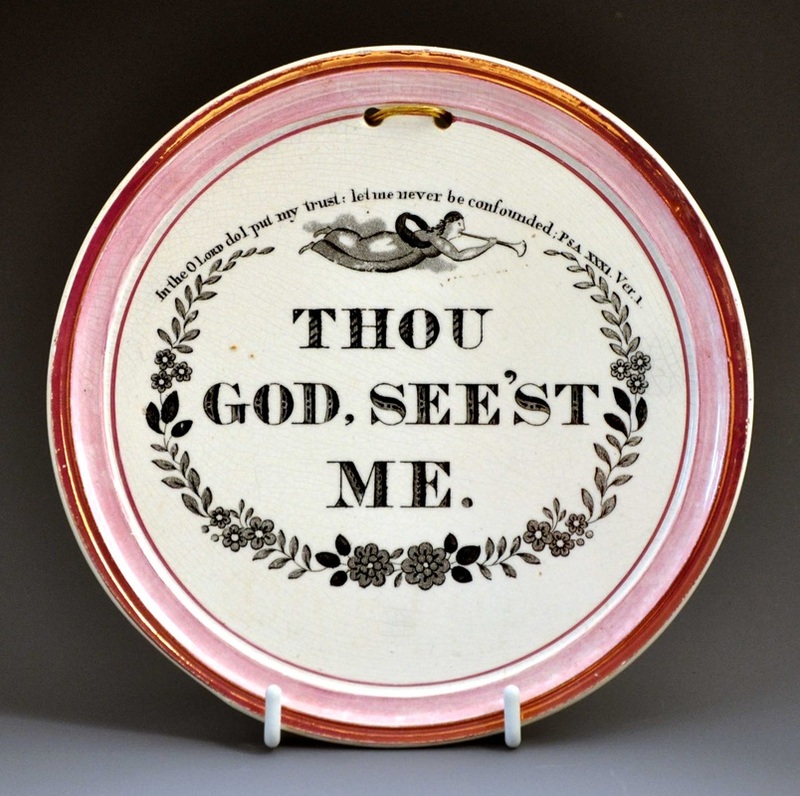 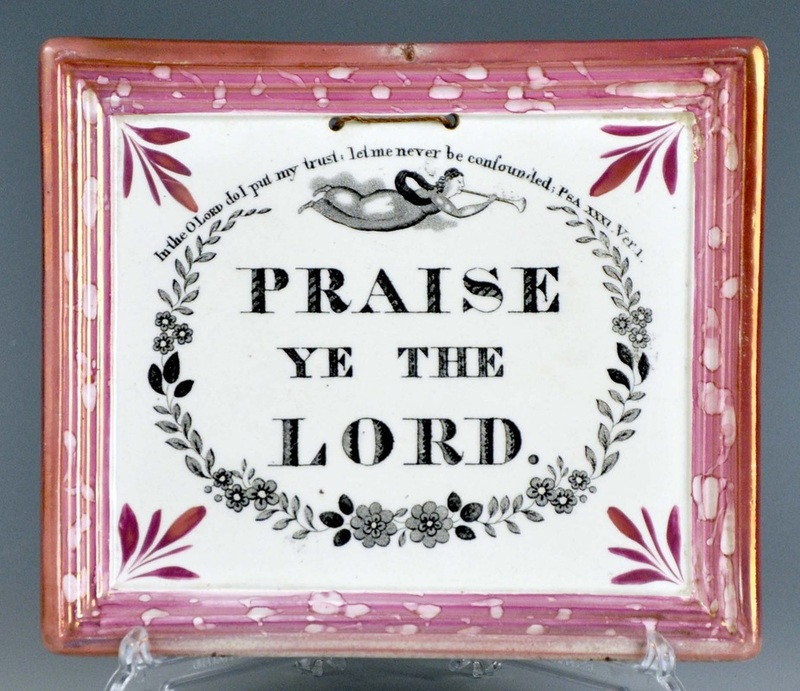 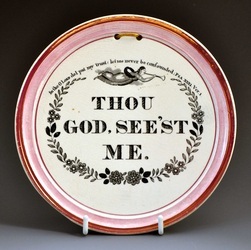 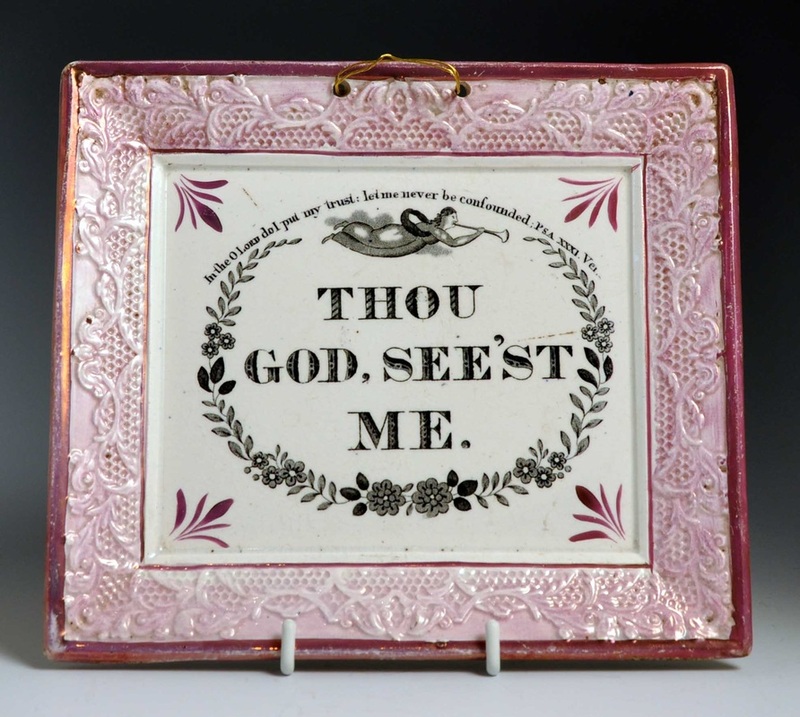 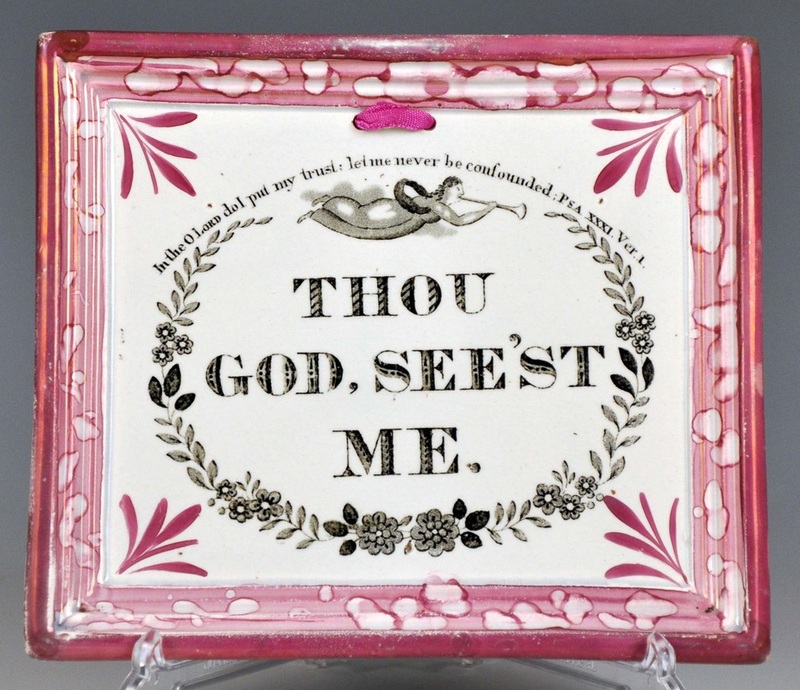 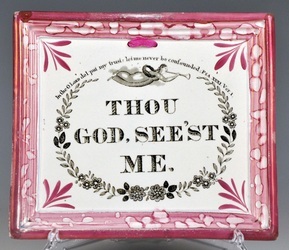 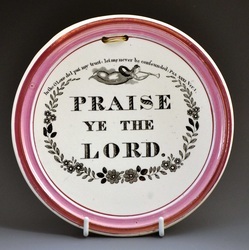 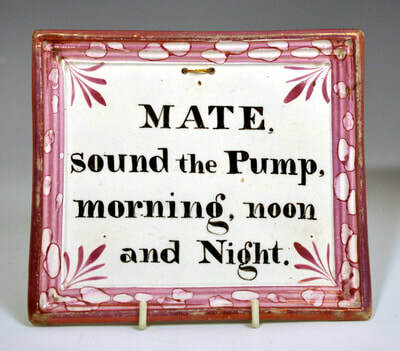 I know of only one other like it, in a Methodist pottery collection in the US. 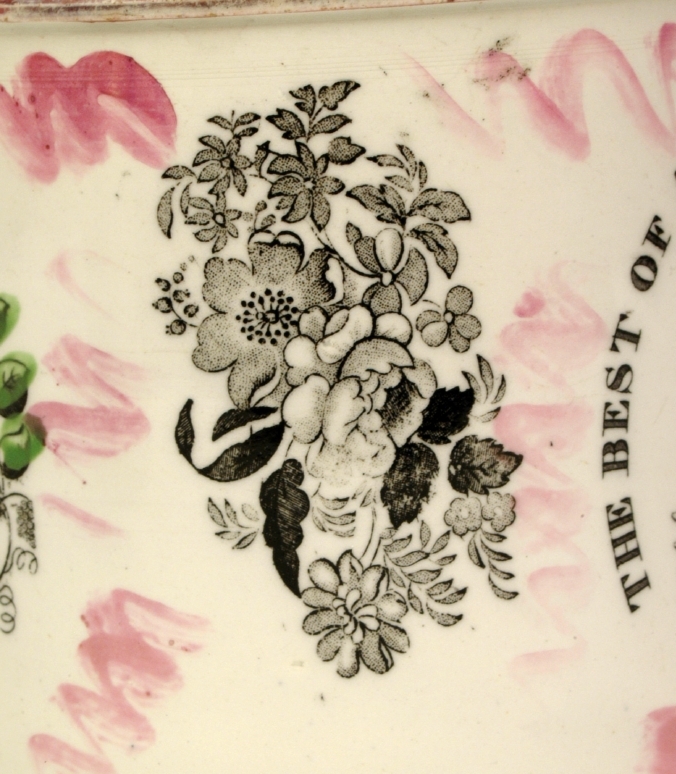 It is of the poor quality of decoration associated with Balls Bros, and was likely made by that pottery post 1897. 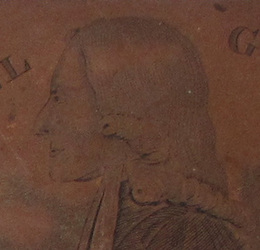 The top and bottom row, circa 167 mm diameter. 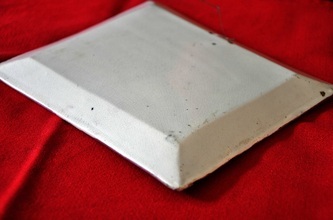 The second row, 170 mm x 145 mm. 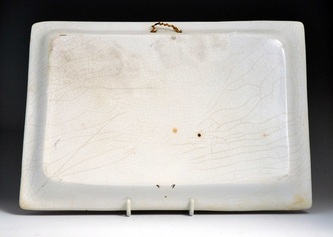 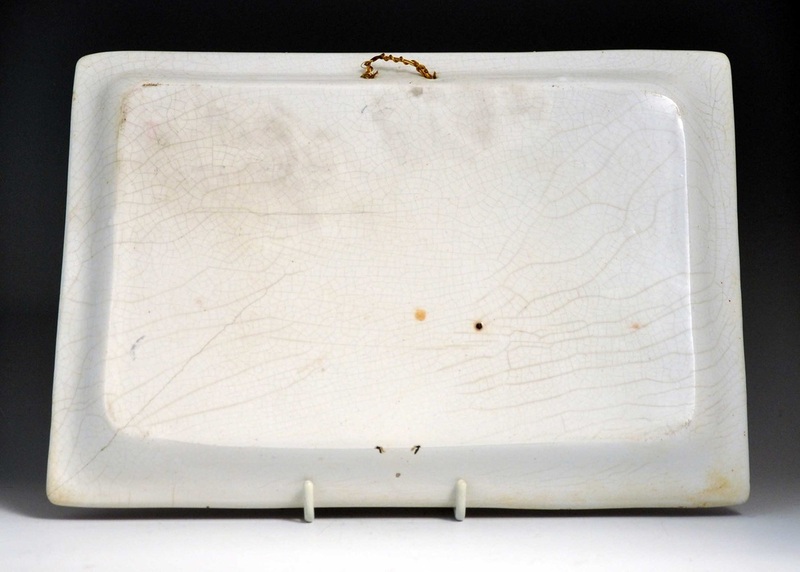 The plaques come from the same transfer plate, and are the same moulds as the plaques in the sections above. 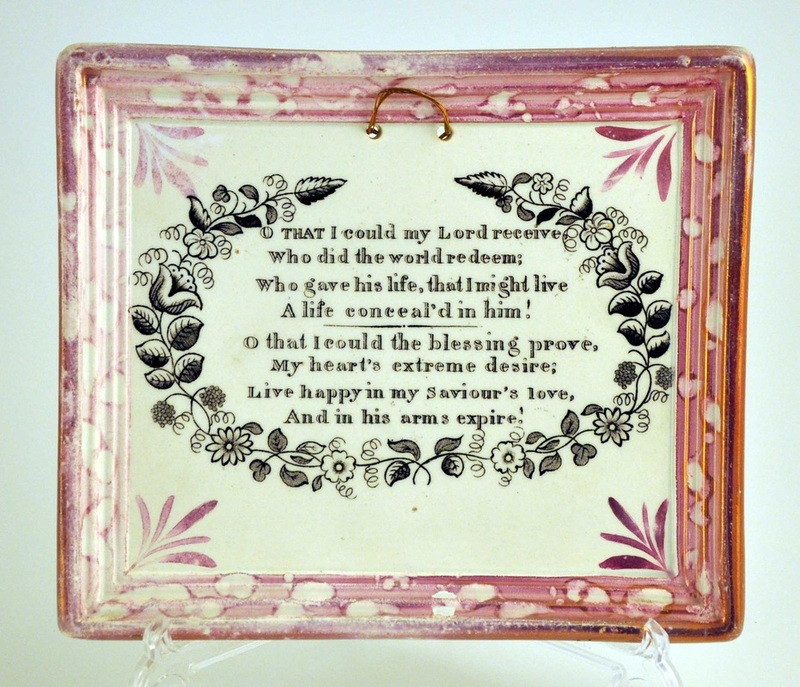 The above transfers also rarely appear on plaques with a moulded decorative border. 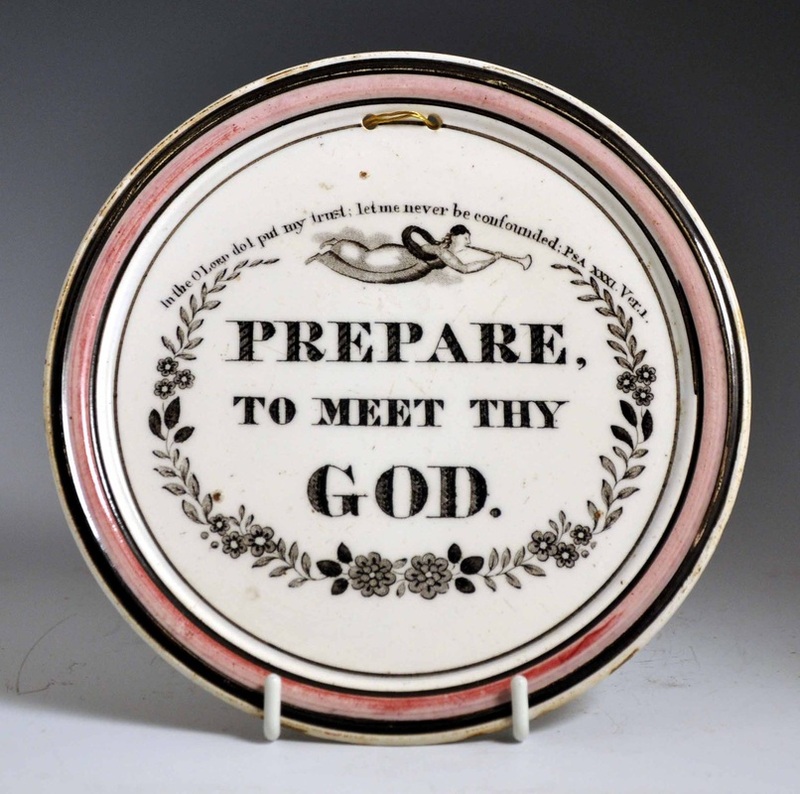 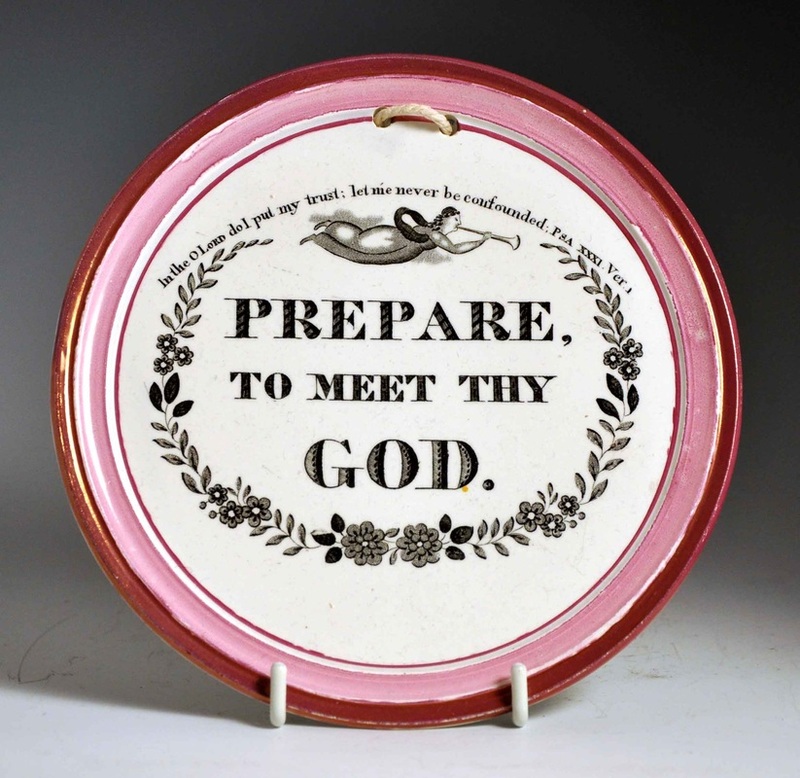 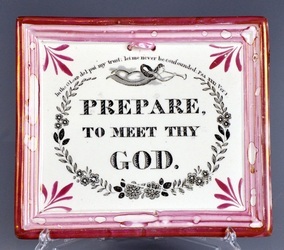 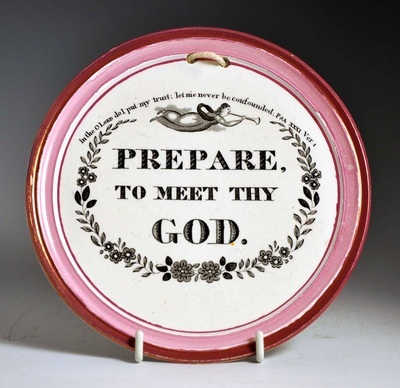 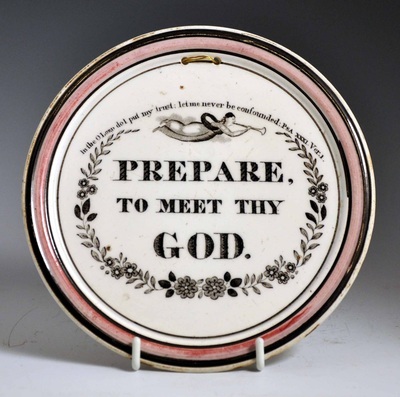 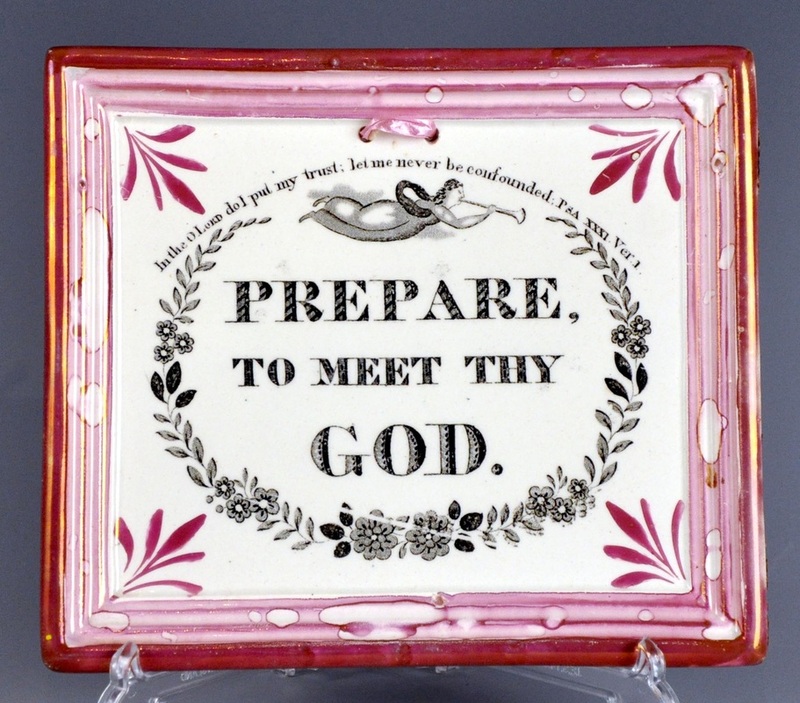 A circular 'Prepare to Meet Thy God' appeared on eBay a few years ago with a similar border. 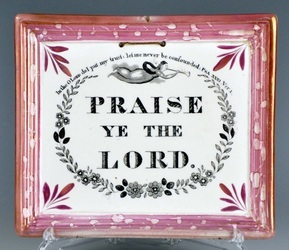 Otherwise, I have seen no other examples. If you have one, please get in touch. 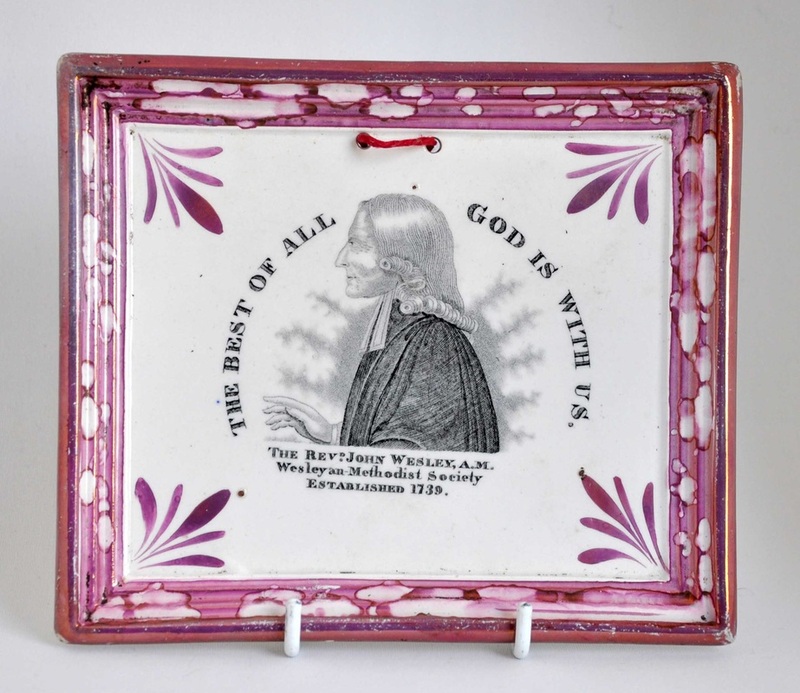 Though larger than the plaques above (195mm x 173mm), these plaques also have a chamfered back.